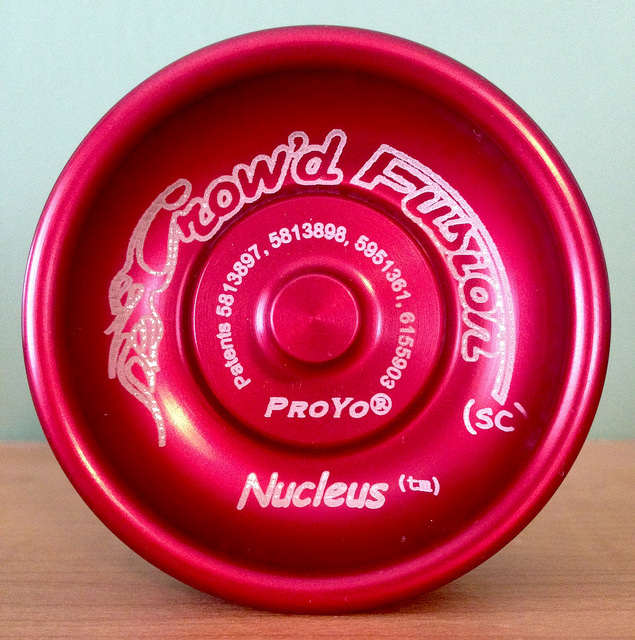 The Crow'd Fusion Nucleus was a limited edition version of the already limited Nucleus. Scarecrow, or Matt Carter, was active in the yo-yo community as an artist in the late 90s. He designed many of the pogs for the various editions of the Bumblebee as well as the art for the Tom Kuhn Celtic and Quatl Mandalas. "Playmaxx finally decided to make a lightweight flywheel shaped aluminum yo-yo, after being constantly bugged by me and a few others. It started with the Isotope1. Shortly afterward, the design was refined into the Isotope2 and a heavier Isotope D2O. They played well enough, but the gap was a bit thin for the progressive style of play at the time. ProYo interestingly decided to manufacture the The Isotope2 and D2O with an odd antique brass anodizing. Then the final version, the Nucleus came out. It retained the light weight and flywheel shape, but had a wider string gap. The reason for the Crow'd Fusion version was pretty simple. I was one of the driving forced behind the design, and my stuff sold well on Skilltoys.com. Mostly it was just marketing and economics, which trumped everything during the yo-yo boom. If I remember correctly, Duncan may have signed the papers for the Playmaxx business already, when these yo-yos came out, but had not assumed control of inventory. All stuff designed after the signing was considered by Tom Van Dan Elzen to be his own stuff, but sold under the ProYo name. Consequently, not of these designs made it over to Duncan, which is too bad. The Nucleus rocked. I could be wrong though. There was a lot of controversy and chest beating at this time, so it's tough to tell exactly what was going on. Steve Brown might have better facts on this, as he was with Duncan at the time." This is widely considered to be the ProYo grail, as very few were made and the two sold on eBay for $1514 and $1250. Of the small number made, a few featured the engraving "Abejero", or beekeeper, as Tom Van Dan Elzen was known online. This is undoubtedly one of my most prized yo-yos.